ILYWAMH | What Does ILYWAMH Mean? 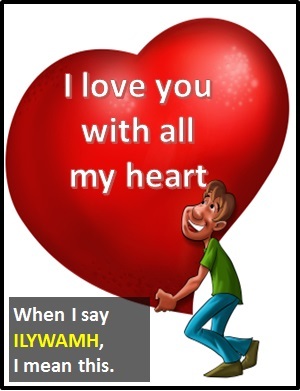 ILYWAMH means "I Love You With All My Heart". ILYWAMH is a romantic thing to say as it implies that your love is total (i.e., you love that person unreservedly). I love you with all of my heart (ILYWAMH) is to love someone unreservedly. Person A: You mean everything to me. You are so special; no one else comes close. ILYWAMH. Person B: I love you so much. Person A: We've been together 60 years and still ILYWAMH. Person B: You old fool. We've had our ups and downs, but I still love you like I did 60 years ago. ILYWAMH is a declarative sentence (i.e., a statement). In other words, it is not used as a part of speech in a wider sentence. Technically, this means it is pronounced using its individual letters (i.e., Aye El Wye Double-yu Ay Em Aitch), but as this is harder to say than "I love you with all my heart," it is not often uttered using its letters. In other words, the abbreviation ILYWAMH is for efficiency in writing and not efficiency in speech.